The law and religion movement is a growing field dedicated to studying the religious dimensions of law, the legal dimensions of religion, and the interaction of legal and religious ideas, institutions, norms and practices. Cambridge Studies in Law and Judaism cultivates scholarship on Jewish topics in law and religion including translations, historical accounts of the foundations of the Jewish legal system, and innovative comparative studies. 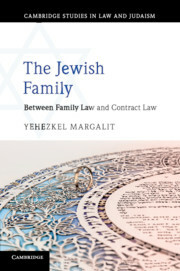 Its mission is to break new ground in studying what Jewish law has, can, and should offer to public, private, penal, and procedural law and legal theory.